This icon of the Mother of God has a wonderful story that explains the commemoration of the event that inspired it and its vivid depiction here, and shows how God is merciful and compassionate towards all men. Once a soldier named Leo assisted a blind man who had lost his way. While looking for water for him, he heard a voice from an unseen person say “Emperor Leo, take water and give it to the thirsty man; then take some of the slime by it and put it on his eyes.” To the soldier Leo’s surprise, a nearby spring gushed out before him. When he did as the voice commanded him, the blind man received his sight. This soldier later became the Christian East Roman or Byzantine Emperor Leo I (457-473). When Leo became the Emperor, he erected a church in honor of the Mother of God at this Life-Giving Spring near the “Golden Gates” in Constantinople where the spring had come up. Later the church was destroyed by the Turks, but in 1835 a new church was built at the same site and consecrated by the Ecumenical Patriarch Constantine. 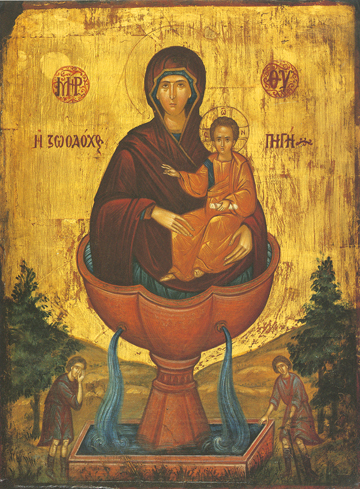 This spring still flows for the salvation and healing of all who come there to the Virgin’s Son.